My guess is that you probably follow other bloggers aside from me and if you do then you may have already heard about my favorite sale which starts this coming week! If not then prepare yourself because I can guarantee you that it is something that will be hyped up in the coming week and in my opinion it is incredibly deserving of that hype. The Nordstrom Anniversary Sale is one of my favorites to shop this time of the year and I wanted to clarify those reasons as to why and share some of my tips for shopping the Nordstrom Sale successfully with y'all. And since you will be seeing lots about the sale, you'll be able to find all of the posts in one place by looking through the label (there is a section for them in the side bar to make searching easier) Nordstrom Anniversary Sale 2016. You're able to shop new fall pieces before you'll even start wearing them. This is one of the few sales I know of that allows you a discount on pieces brand new for the season before said season even begins. This means that things you'll want to wear all fall and winter get to make their way to your closet before it's too late to wear them like most other sales. Big purchase items are often hundreds of dollars off. If you're like me then you hate having to dish out money for jackets, handbags, and riding boots even though you know that given how frequently you wear them they end up being completely worth the cost. Fortunately during the Nordstrom Sale those are the pieces that tend to be most heavily discounted! We are talking hundreds of dollars off making biting the bullet on those pieces a little less painful. Basic pieces and essentials are also on sale. While a lot of people enjoy shopping this sale since they are able to get trendy new fall and winter pieces on sale it's also important to note that basic pieces and essentials that serve as the foundation for your wardrobe are also discounted. For me those essentials are definitely jeans and comfy versatile sweaters. Both of these pieces can be transformed with accessories but are staples to have in your wardrobe and build around. Many makeup items (including palettes and gift sets) are super discounted. So I am no pro when it comes to makeup but I do enjoy testing out some new products on occasion. Typically I don't want to spend a lot of money on something I am not positive whether I'll like or not so the Norstrom Sale is great because I am able to purchase those pieces on sale and oftentimes in gift sets that allow me to try out a range of products in a singular purchase. The deals are better than Black Friday. This may sound dramatic but I promise you that a lot of the deals during this sale are better than those you'll find on Black Friday AND you'll get more time to actually wear the pieces since you won't have to wait until the end of December. Sign up for a Nordstrom card and/or their reward program. So if you have checked Nordstrom's site recently you may have noticed that the sale has two different start dates. The first date, July 14th, is when the sale opens for Nordstrom Card Holders. The second date, July 22nd, is when the sale opens for non card holders. In the past, products have been known to sell out in sizes or color choices during the time where only card holders have access which is great incentive to sign up for your own Nordstrom Credit or Debit card. You can do this in store or online and it's not too late to go ahead and do that now in order to shop the sale early. Another great option if you're not wanting to sign up for the credit or debit card but are a loyal Nordstrom fan would be to sign up for their reward program. By doing this before the sale you will get a $10 credit to use during the sale (I'm sold!) and will gain points to be used on future rewards thanks to your Nordstrom purchases. You can be both a card holder and reward member so consider signing up for both for added bonuses but know that the sale is still worth shopping even without these two things. Sign up for the reward program here and your own Nordstrom card here! Browse the catalogue to familiarize yourself with the products and deals offered. One great thing the Nordstrom does before their sale is release a catalogue featuring some of the products you'll be able to purchase during the sale. This gives you a pretty good idea of some of the items that you'll be able to shop during the sale as well as some of the trends that are on the horizon for fall. Peruse your closer to discover what fall staples you actually need. Sometimes big online sales can lead to impulse buys. While that can be good on occasion you definitely don't want to end up purchasing tons of pieces that may look cute but may not be practical for your wardrobe. I suggest making a list of items that your closet may be lacking and start by shopping for those pieces. Take advantage of stocking up on the essentials. You can never have too many basics to have on rotation to make getting dressed in the morning a breeze. While those basics may differ for some people the sale offers a great selection of essential items for your wardrobe at a discounted price. I know I hate spending money on boring things that are just must haves in your closet so the sale is the perfect time to purchase them. Know that Nordstrom has free shipping and returns as well as great customer service. Nordstrom's free shipping and returns is great since you are able to check out more than once without having to worry about paying for shipping for each transaction. Lots of times I will put off ordering things online since I don't want to have to pay an additional amount just for shipping. This feature is especially nice during the sale since there are so many pieces on sale that you are bound to find other pieces you may want after already making a purchase. Additionally, Nordstrom's customer service is top notch so don't be afraid to take advantage of that during the sale as needed! Use this sale to replenish any beauty items you may be running out of, gather hostess gifts, or gifts to give during the holidays. This one is pretty self explanatory but my last tip would be to take advantage of this sale as a way to stock up on items you're running out of (especially in the beauty realm). This is also a great sale to go ahead and stock up on small gift items to have on hand for whenever you may need them while also making some bigger purchases to put away and bring back out around the holidays! So in a nutshell: Sale opens to cardholders July 14th and general puplic July 22nd. The sale ends on August 8th and features new fall merchandise marked down before the season even starts! 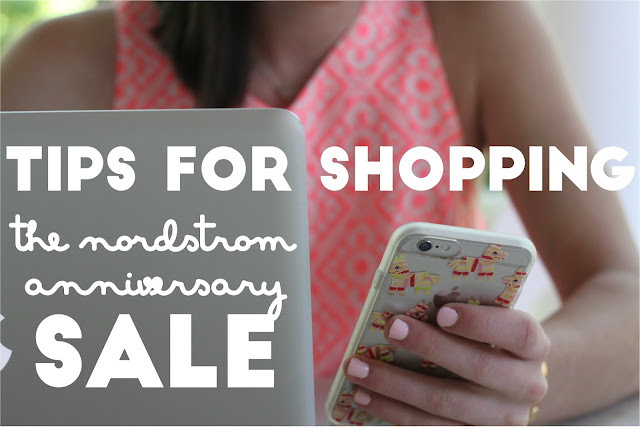 I'd love to hear why you may love the Nordstrom Anniversary Sale or what specifically you're hoping to shop for during it! Great tips! I can't wait for the sale!